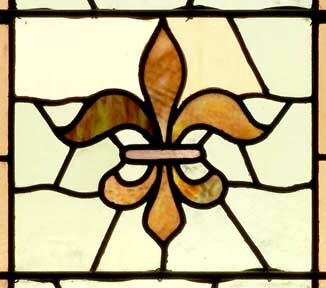 In French, "fleur-de-lis" means "flower of the lily." A very old emblem, the Empress Theodora (A.D. 527) bore one on her crown. The coat of arms of ancient France (1179) was blue field sprinkled with fleur-de-lis. English kings later used the symbol on their coats of arms to emphasize their claims to the throne of France. 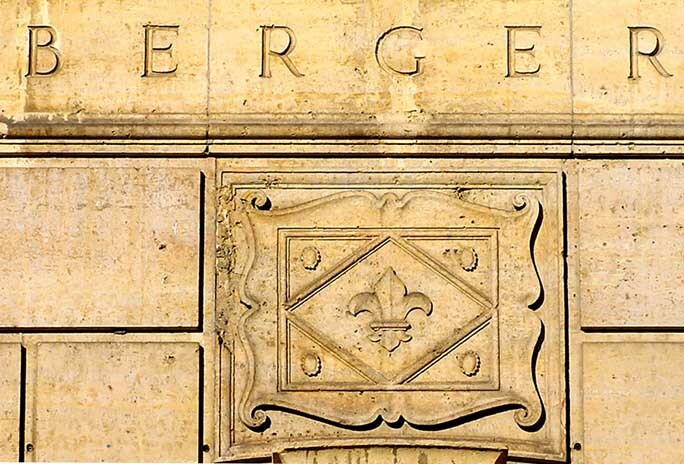 Fleur-de-lis is also an emblem of royalty given to the Virgin Mary as Queen of Heaven. "Louis VII of France dreamed of irises before setting out on the Crusades in 1137 and considered them to be a sign, and therefore adopted the flower as his emblem. It became known in France as the Fleur de Louis. They were popularized in England by Edward III, although they were dropped as a national standard during the Napoleonic Wars. Adopted by Christianity as a symbol of the trinity." - Gus Tassara, "Plant Symbolism"
Commonly found in Gothic and Gothic Revival styles. Used as decoration on furniture, also. Hamburg Grange Building, Hamburg, N.Y.
Furniture: Reproduction Hepplewhite side chair - Kittinger Furniture Co.